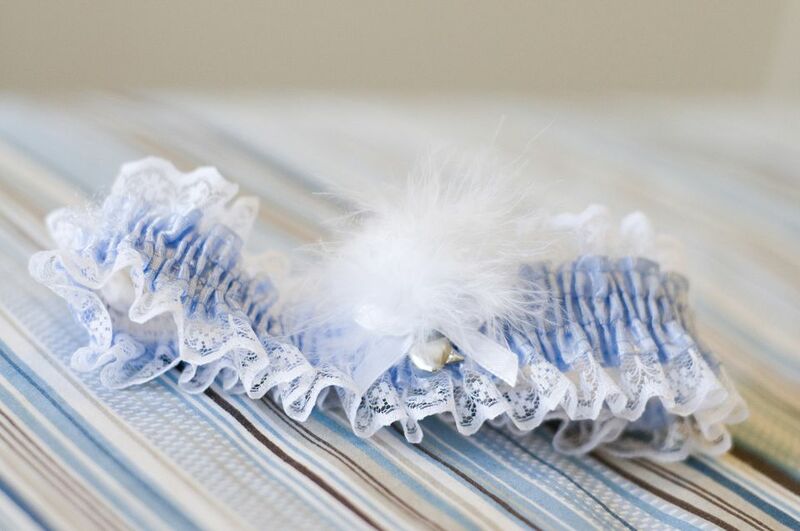 A bridal garter makes a great shower gift. Sew it yourself and make it special! Add embroidery with names and dates. Add a touch of color that the bride has chosen for her reception and she'll know it was tailor-made just for her. This free sewing project is so easy, you may want to sew two garters... one for the bride to keep and one for her to toss at her wedding reception. 26" of flat (not gathered) 2" - 2 1/2" wide lace with one scalloped or decorative edge. 26" of 1/4 - 1/2" wide flat lace with one decorative edge for the top edge of the garter. 2 pieces or 26" of 1" wide white satin ribbon (or one satin and one grosgrain ribbon). 13" of 1/2" wide elastic. 1/4" wide ribbon for decorating. Embellishments to decorate the garter. Align the ends of the lace and the ends of the ribbon. Lay the straight edge of the lace on the bottom edge of the ribbon so the lace overlaps the ribbon by an eighth to a sixteenth of an inch. Sew the lace to the ribbon, sewing an even distance from the edge of the ribbon and as close to the edge of the ribbon as possible. Repeat to attach the narrower lace to the top edge of the ribbon. Align the second piece of ribbon directly under the first piece of ribbon. Top-stitch the ribbon to attach it to the first piece of ribbon, sewing as close to the edges as possible. Repeat for the second edge of the ribbon. Using a safety pin or a bodkin, thread the elastic between the pieces of ribbon. Stop pulling the elastic through as the end of the elastic aligns with the ends of the ribbon and stitch the elastic to the ends of the ribbon. Continue pulling the elastic trough and align the end of the elastic with the opposite ends of the ribbon. Stitch the elastic to the opposite end. A French Seam is best to seam the ends of the garter together. Place the wrong sides (the side which will be against the leg) of the garter together and align the ends and edges. Sew a seam, using a scan 1/4" seam allowance. Fold the garter on the sewn seam, so the right sides of the garter are together and the sewn seam is the edge. Sew a seam using a 1/4" seam allowance, which will enclose the raw edges. Decorate the garter as desired. To decorate it as shown in the photo of the finished garter, use the following steps. Cut 3 six inch pieces of 1/4" wide ribbon. Keeping one side of the ribbon up, loop the ribbon and lay it on top of itself. Repeat for all three pieces, pinning the overlap in place. Lay all of the sections on top of each other and fan the loops. Hand-sew the loops in place. Sew a decoration on top of the loop intersections. A button was used here but a bead or ribbon rose could also be used. Sew a color ribbon that is less than 1" wide on top of the outer satin ribbon before assembling the garter. Consider using a novelty sports, or hobby decorated ribbon for a fun touch. Use a solid fabric as the ruffled lace and embroidery initial or wedding date before assembling the garter. Add an applique to the garter.